I’m an on-ear/over-ear headphone guy. To me, the size and weight has always been a price worth paying for the far higher quality and sound isolation they deliver when compared to consumer-grade in-ear headphones. Most headphones use dynamic drivers to generate the sound. These can put out a lot of sound from something reasonably compact. Higher-end in-ear monitor headphones tend instead to use what’s known as a balanced armature transducer to create the sound. These can be tuned extremely precisely to generate a very accurate reproduction of the original signal – but don’t deliver much volume. Top-end IEMs use two or three BAs, each handling different frequency bands, to deliver greater volume – an expensive approach. The Trinity Delta IEMs take a hybrid approach, using a combination of BA and 8mm neodymium drivers to deliver very accurate sound while also providing sufficient volume for the bass. To top it off, it comes with a set of three different filters to allow you to adjust the balance of the sound. The Trinity Delta looks and feels like quality kit. 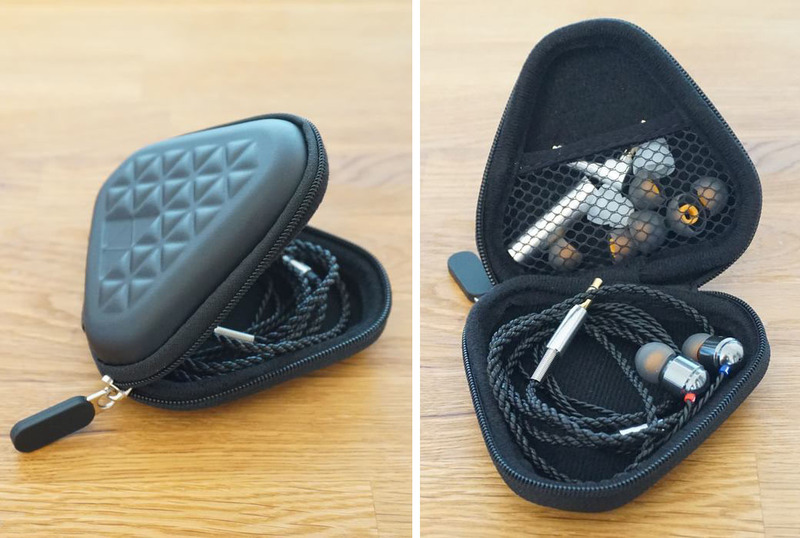 The casing is gun-metal CNC aluminum, the eartips are extremely soft and comfortable, the 3.5mm jack in polished aluminum with gold-plated tip and the tangle-resistant cable all add up to something which is pleasing to the eye as well as the ear. You get five sets of ear tips in a very wide range of sizes, so I’d be very confident that almost everyone would be able to find the perfect fit for them. Swapping them is, though, extremely fiddly! If you’re someone who shares earphones with your partner by swapping the tips, I think you’ll be out of luck here – it just takes too long. Once in place, however, they are very secure: you won’t be losing them. With some devices, a straight jack is good, with others, a right-angled one is better. 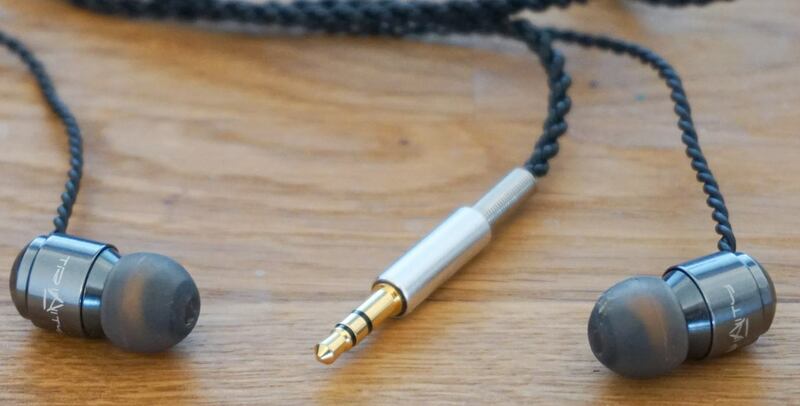 These come with a straight jack plus a right-angled adapter, also with a gold-plated tip. You also get a handy and attractive carrying case, which accommodates all the spare tips and the filters – of which more in a moment. I have two complaints about most in-ear headphones. The first is that they don’t isolate me from surrounding noise as much as I like. I’m not a great fan of noise-cancelling headphones – I do like to retain some awareness of the sounds around me – but I do like those background sounds to be significantly muffled. My acid test is if I can be largely unaware of environmental sound, but still hear when a PA announcement is made. Once I’d switched to the second-largest tips, the Delta headphones passed this test well. My second issue with in-ear units is that they don’t seem to deliver as rich a sound as I get from on-ear and over-ear headphones. These didn’t quite compare with my own personal gold standard for headphones, my B&W P5s, but they came closer than I’ve ever experienced with in-ear headphones. Given the price difference, I was astonished by how close they came, and can definitely see that there will be occasions when I’ll leave behind the larger units in favor of these. You get three sets of tuning filters, which allow you to fine-tune the sound to your own particular tastes. They are supplied with a stylish aluminum tube to store the two you’re not using. The filters simply unscrew from the main housing, and can be quickly and easily replaced – though of course you’ll then need to swap the tips over. The filters are color-coded, but the instructions don’t specify what each does. I found the champagne-colored ones were best for vocals – my priority – while the silver gave more bass. The purple seemed the most neutral. I chose my phrase carefully here: this is not a tangle-free cable. The cable did still manage to loop itself together, but it is sufficiently stiff and slippery that it never gets knotted and is very easy to unwind. Trinity is very specific about what it’s aiming to achieve. At $135/£90, these are not budget headphones, but they are remarkably affordable for the sound quality they deliver. Couple that to the build quality and the thoughtfulness that has gone into everything from the right-angle adapter to the aluminum tube for the spare filters, and I’d have to describe them as a very good value. The Trinity Delta In-Ear Monitors are available from Trinity’s website.